BRENTFORD | Button, Bidwell, Dean, Djuricin (Hofmann 75), McCormack (Kerschbaumer 78), Woods (Canos Tenes 71), Judge, Swift, Diagouraga, Tarkowski, Yennaris. SUBS | Bonham, Hofmann, Kerschbaumer, Vibe, O'Connell, Gogia, Canos. WOLVES | Martinez; Iorfa (Doherty 78), Batth (c), Hause, Golbourne; Henry (van La Parra 53), McDonald, Coady, Ojo (Price 53); Afobe, Le Fondre. SUBS | Ikeme, Doherty, Price, Wallace, van La Parra, Byrne, Enobakhare. Another bleak weekday result. Derby didn't score against poor Blackburn tonight after making all the fuss about Chris Martin being the best striker in the Championship. Better luck next time, boys. Thanks, bloggers. Full time, 0-2. 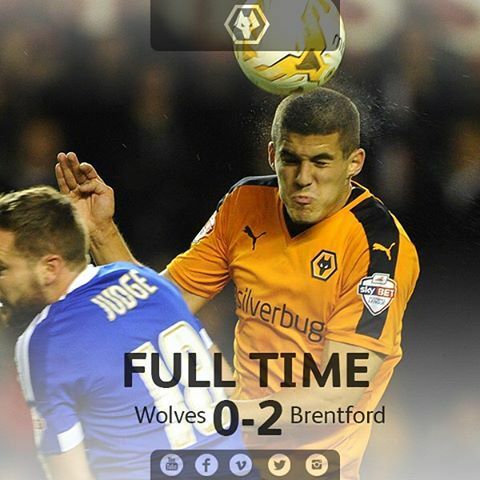 Wolves simply not good enough for anything on the night. a budget which is league one level = a team battling relegation which we are so whats the shock ? KJ`s "tinkering" is an act of desperasion! !